Johannes Kepler (1571-1630), who although is perhaps better known for his work in astronomy, most notably with his three laws of planetary motion, was also very much concerned with tessellations and polyhedra, and indeed, his interest in the latter very much influenced his astronomical thinking, discussed in more detail below, albeit his ideas were based upon a false premise. (Incidentally, Kepler has recently been in the news with two contemporary astronomical events. Firstly, in 2004 (and soon again, in June 2012, with a transit of Venus across the Sun of 8 June, as he was the first astronomer to undertake this most difficult task of calculating and then predicting when this occurrence would then take place, the first such determination being of the year 1631. Cruelly, Kepler was denied seeing this, as he died the previous year. Such a feature is an exceptionally rare astronomical phenomenon (at least in terms of human life spans, as it occurs in pairs, with intervals of 105 to 122 years, followed by another 8 years after). Furthermore, one's location on Earth is critical for viewing, as the longest duration is of seven and a half hours, and so consequently this can occur at night time (and thus be missed) for those who find themselves in an inappropriate geographical place. Secondly, in 2009, with the NASA spacecraft Kepler, with a telescope designed to look for planets transiting their own suns.) Indeed, he made some notable pioneering contributions and discoveries to both of these fields, of which he discussed at length in one of his major works Harmonice Mundi Books I-V (1619), in effect a synthesis of his ideas concerning the universe at large consisting of Geometry, Architecture, Harmonies, Metaphysics, Psychology, Astrology and Astronomy. The following text thus gives an overview of his accomplishments in these fields, separated into tessellation and polyhedra sections, of which for the sake of clarity I arbitrarily define and discuss specific aspects. Kepler's study is of importance in a historical sense, in that for the first time a systematic analysis is undertaken, this in effect replacing earlier studies of an essentially sporadic nature. Although earlier examples of tessellation studies can indeed be found all over the world (the earliest dating back to Archimedes, albeit his work is lost), these cannot be recognised to the same degree of thoroughness, and so Kepler's study to all intents and purposes can be regarded as the starting point per se. 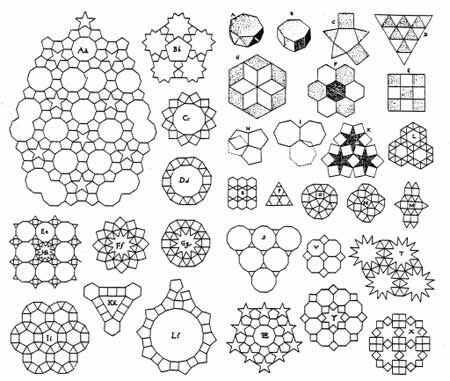 More specifically, he first defines and illustrates the minimum set of tessellations known as Semi-regular or Archimedean, discussed in detail below. However, despite the subject finally being put on some solid foundations, somewhat disappointingly Kepler's work was then neglected, resulting in a whole host of mathematicians spending needless time composing tessellations that had already been studied. Furthermore, to add insult to injury they obtained spurious results, in effect adding erroneous tessellations to the above set, from which subsequent mathematicians repeated their errors. Indeed, upon the publication of Harmonice Mundi the subject per se basically went into a slumber, only really awakening in the latter part of the 19th century. As mentioned above, Kepler is generally credited with the first systematic explanation of the set of tessellations known as Semi-regular or Archimedean, which are tessellations composed of the regular polygons, of which there are eleven distinct examples. An illustrated plate from Harmonice Mundi containing these diagrams is shown above, albeit it is not of the greatest clarity due to these being intermingled with other tessellating diagrams. Again, the study of these has forerunners, most notably with many examples from the Arabic world, preceding Kepler by many centuries. However, I have yet to find any evidence that Kepler was aware of such studies. Examples by Kepler can be seen on the above plate from Harmonice Mundi, denoted as Aa and Bb, of which these are still of interest to the present day, having been investigated by a succession of mathematicians, details of which are to be found in Tilings and Patterns, pages 88-90. Again, Kepler made some breakthroughs in this field, discovering new types. More specifically, he catalogued and illustrated the set of thirteen solids known as Archimedean. 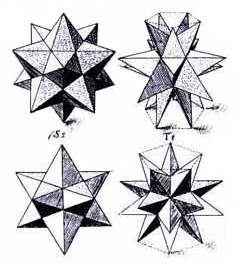 Other discoveries are solids which form as part of a sub-set are the small stellated dodecahedron and great stellated dodecahedron, of which these two are actually part of a set of four, as Kepler missed two other members, found subsequently by Louis Poinsot in 1809, and so these are now known as the Kepler-Poinsot solids. Furthermore, he also discovered a member of the rhombic family, the triacontahedron. Further discoveries include the Semi regular prisms and Semi regular antiprisms, of which all are thus discussed in more detail below. 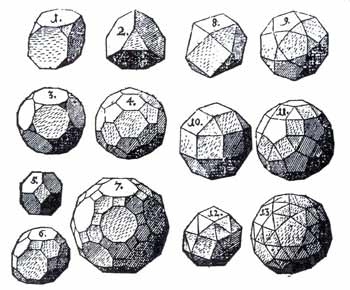 Although Kepler defined and illustrated this set in Harmonice Mundi (defined as the complete set of convex uniform polyhedra), he cannot be credited as the discoverer of these solids per se (although he believed himself to be so), as Archimedes is again is the first such reference (albeit his work is lost), hence their title. Kepler nonetheless made a major contribution in that for the first time he defined and systematically analyses all possibilities, proving that there are thirteen such solids. Furthermore, he also gave them the individual names by which these are known today, all illustrated in the plate from Harmonice Mundi above. Kepler can, to all intents and purposes be regarded as the discoverer of these two non-convex solids, shown as Ss and Tt in the plate from Harmonice Mundi below, as he undertook a systematic analysis for the first time. Although earlier examples ‘of sorts' can indeed be found (notably of a mosaic attributed to Uccello and a drawing by Wentzal Jamnitzer respectively), these can be regarded as essentially non-systematic in their undertaking, and so as Kepler gave the first true mathematical explanation, they are thus known in his honour as Keplerian solids. 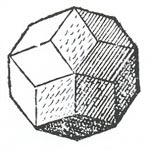 However, even Kepler was not infallible in his analysis, as he missed two further examples of this particular category (of non-convex polyhedra), these being discovered by Louis Poinsot in 1809 (albeit an earlier reference by Jamnitzer again shows a drawing of the Great Dodecahedron) and so these are thus accordingly now known as Kepler-Poinsot polyhedra. 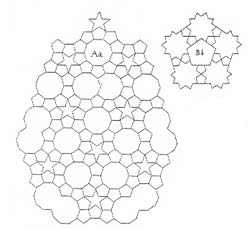 A discovery of Kepler's concerns prisms, of which he pointed out the two possible types, namely semi regular prism and antiprisms, as shown by his diagrams A and B in Harmonice Mundi on the tessellation plate. These solids, having much in common with the Archimedean polyhedra (as noted by Kepler), form an infinite series, of which a discussion and picture of these as a series are in Shapes, Space, and Symmetry by Alan Holden. 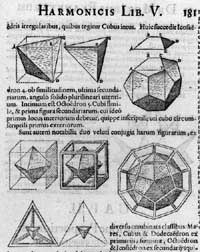 Kepler is generally credited with the discovery per se of this thirty-sided rhombic-faced solid, first describing it in De Nive Sexangula (1611) and with a published illustration in Harmonice Mundi (1619), shown below. Again, this has precursors, as Wentzal Jamnitzer in Perspectiva Corporum Regularium (1568) shows something similar, albeit with no mathematical background to his example. A further, more technical discussion of the background to this solid is in Kepler's Geometrical Cosmology by Judith V. Field, pages 202-219. Additionally, two of Jamnitzer's plates are shown, pages 208-209. Kepler made a special study of this twelve-sided rhombic solid, as he believed that this was previously unknown, albeit this was not actually the case - indeed, this solid had been known since pre-recorded times, more of which below. As such, forever looking for geometrical relations with polyhedra as applied to astronomy, the rhombic dodecahedron was thus used, in simple terms, for the purpose of ‘explaining' the four (newly discovered) satellites of Jupiter. Again, his work on such matters has subsequently proved spurious. More details of at times a technical nature are to be found in Kepler's Geometrical Cosmology, pages 218-219. An interesting property of the Rhombic dodecahedron is that it can be formed by 'assembling' six right-angled pyramids around a cube. The diagram at left, taken from Kepler's Epitome Astronomiae Copernicanae shows in broad terms the 'construction'. Alternatively, the process can be 'reversed' with right-angled pyramids and a cube being derived from the rhombic dodecahedron. My own polyhedra page shows bird-like tessellations covering both the right-angled pyramid (No.4) and cube (No.5) as individual entities, followed by an 'assembly' to show this property (No.6). The rhombic dodecahedron is very interesting per se as it possesses other properties. First, it is one of only three polyhedra that will fill three-dimensional space, the others being the cube and truncated octahedron. Furthermore, it also occurs in the natural world, as it occurs in the form of garnet crystals. An interesting feature of polyhedra is that of their inscription of each other. Some examples of Kepler's, from Harmonice Mundi, of an icosahedron inside a dodecahedron and of a octahedron inside a cube, are shown. 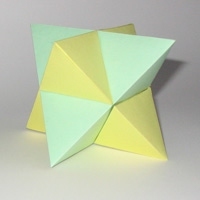 Kepler named this solid in recognition of the fact that by noting that this could be formed by the process of stellating the octahedron, hence a stellated octahedron or Stella Octangula. Another interpretation of this solid is that it is formed by the inter-penetration of two tetrahedra. Again, although all solids are interesting, some can be said to be of a more aesthetic nature than others are, of which the Stella Octangula undoubtedly is. Indeed, this particular solid has been the subject of a whole book, The Stella Octangula Activity Book, written for a popular audience. The example shown left, taken from my own collection, of which to emphasise the interpenetrating aspect of the tetrahedrons are thus shown as distinct colours. 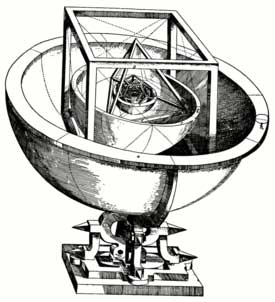 As such, Kepler was a mathematician with a noticeable leaning towards polyhedra; an interest that is somewhat specialised, and essentially remains so to the present day. Indeed, it is possible to be an eminent mathematician and yet remain unversed in their various intricacies. Now, part of the reason for Kepler's interest in polyhedra was that he was convinced that the universe (which in his day consisting solely of the visible planets out to Saturn and of the stars, which were thought to be relatively nearby) was ‘arranged' by divine means as according to the various ‘proportions' and ‘spacing' of the regular polyhedra. Kepler showed this by noting that the five regular polyhedra when so placed accordingly fit conveniently into the spaces between the six planets, of which an illustration is shown below in a plate from Mysterium Cosmographicum (1595). On occasions, past and present, he is all too often derided for this idea, as the proposal for such a scheme appears on the face of it patently absurd. Upon a general reading of his works, without delving into background details, people think that he intended actual physical polyhedra existing in space, but this is not so. More precisely, he intends such polyhedra as theoretical points and not models per se. Admittedly, such reasoning of his has subsequently been found wanting, due to additional planets having subsequently being discovered, but at the time, such a proposal was justifiable because of his data. A simple, straightforward explanation is that he was looking for some kind of geometrical structure underlying the ordering of the planets, and thereby set out to look for a correlation, an analogy of which is to be found in gravity, with falling bodies having a geometrical progression.